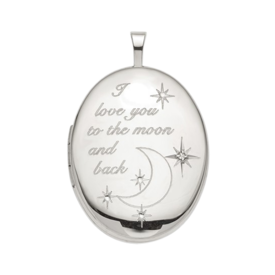 Sweet Sterling Silver "I Love you to the Moon" diamond oval locket. This locket measures 20mm and weighs about 4.24grams. Accent diamond is very tiny, .015ct. This locket will hold 2 photos and we are including a chain, 16" or 18" you decide. Beautiful Sterling Silver Love, Hope, Faith heart locket. This locket measures 20mm and weighs 3.17grams. Pretty Sterling Silver rhodium plated handprints ash holder heart locket. 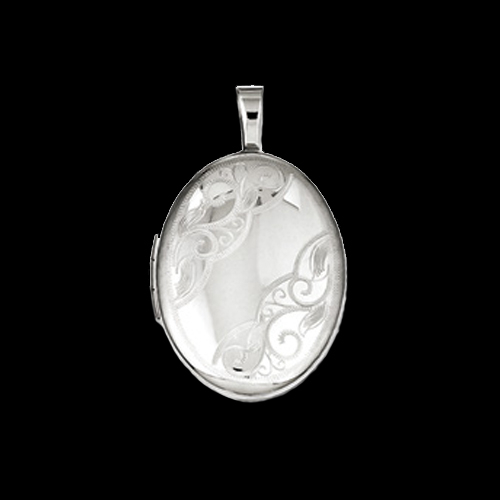 Lovely Sterling Silver oval locket. This pretty silver locket measures 34mm top to bottom and features a beautiful leaf design border. 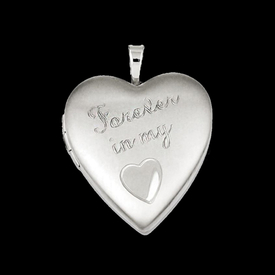 Locket will hold 2 of your keepsake photos. 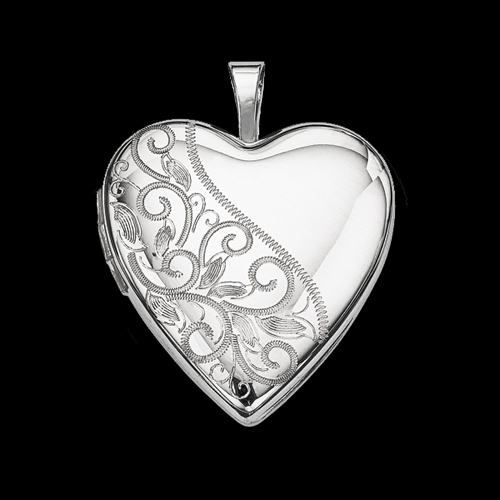 Elegant Sterling Silver heart locket. 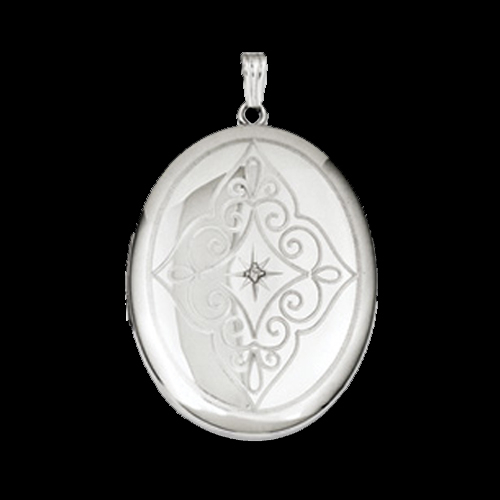 This pretty silver locket measures 20mm and features a lovely scroll design with a diamond center. Locket will hold 2 of your keepsake photos. 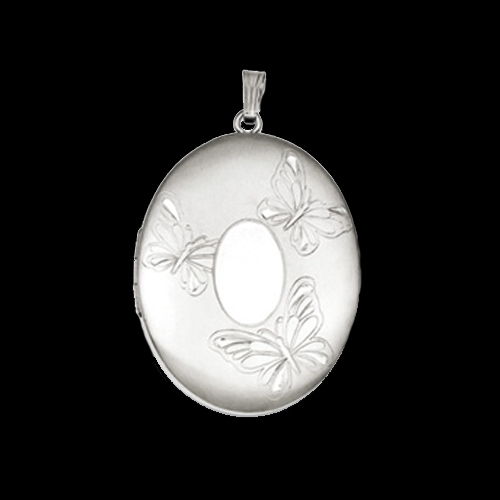 Beautiful Sterling Silver butterfly oval locket. This pretty silver locket measures 34mm and features 3 diamond cut butterflies for a fun design. Locket will hold 2 of your keepsake photos. Beautiful Sterling Silver floral heart locket. 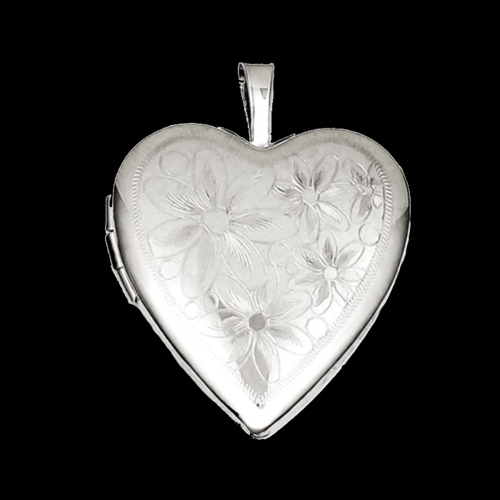 This gorgeous silver heart locket measures 24mm and features a diamond cut floral design with enamel for an extra kick. Locket will hold 2 of your keepsake photos. Pretty Sterling Silver "Forever in my Heart" heart locket. 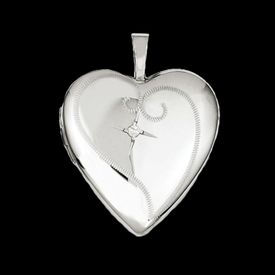 This delightful silver heart locket measures 20mm. 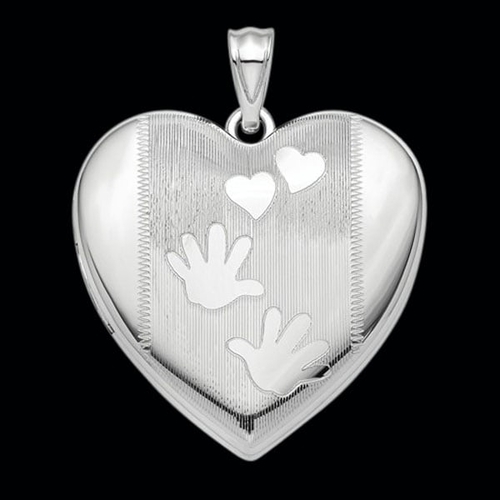 Locket will hold 2 of your keepsake photos. Pretty Sterling Silver textured daisies heart locket. This delightful silver heart locket measures 20mm. Locket will hold 2 of your keepsake photos. 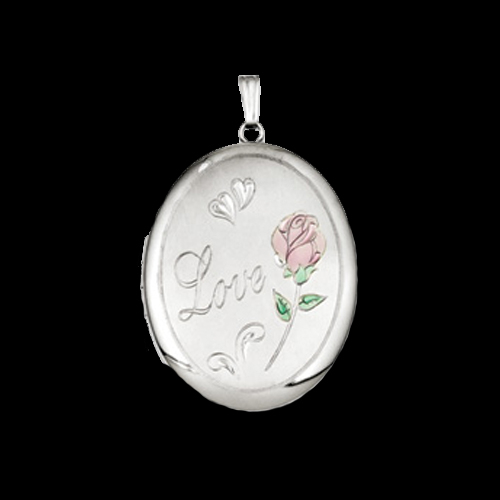 Large Sterling Silver love with an enamel rose design locket. 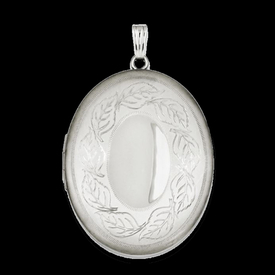 This delightful silver oval locket measures 34mm in length and holds 2 photos. 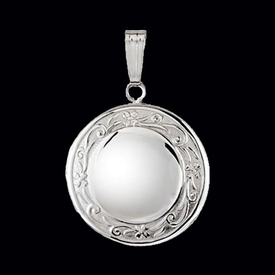 This silver locket features a satin and polished finish. Pretty Sterling side swirls design locket. This delightful silver oval locket measures 19mm in length and holds 2 photos. Large Sterling Silver diamond and swirl design locket. This delightful silver oval locket measures 34mm in length and holds 2 photos. 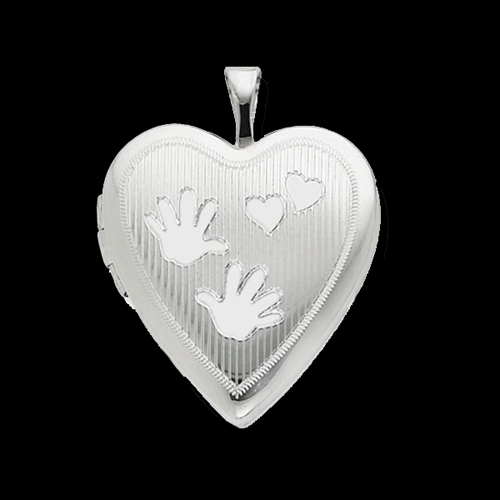 Pretty Sterling Silver handprints heart locket. This delightful silver heart locket measures 20mm and comes with an 18" silver chain. Locket will hold 2 of your keepsake photos. 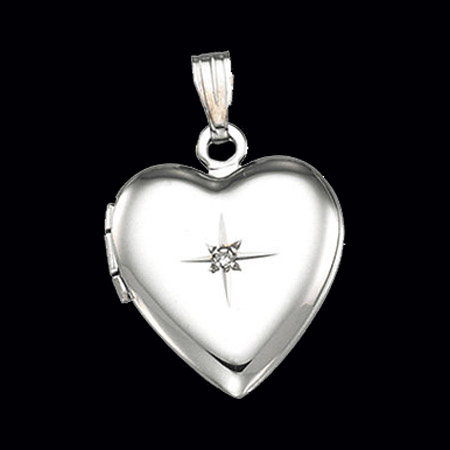 Beautiful Sterling Silver diamond heart locket. 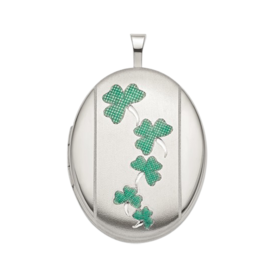 This locket measures 22.25mm by 14.25mm and is a top quality locket. Center accent diamond is just an accent at 1.3mm round but does add a lot of style to an already lovely locket. Will hold 2 of your precious photos. We have suggested a chain option to create a necklace. 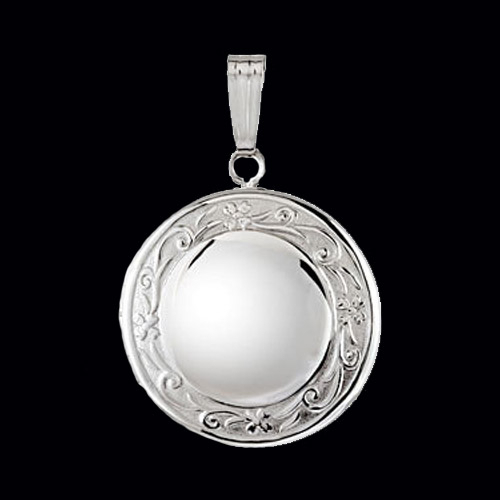 Pretty sterling silver round locket. Locket measures 18.50mm and will hold 2 photos. This silver locket features a lovely scroll border design on a mat finish center. We have listed a chain option to create a necklace. 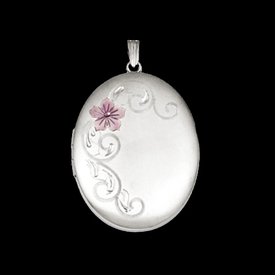 Pretty sterling silver large oval locket. Locket measures 29.25mm in length by 15.50mm wide and will hold 2 photos. 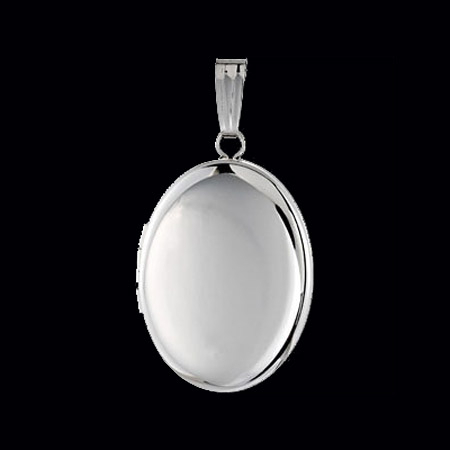 This silver locket is a simple yet classic plain design polished locket. We have listed a chain option to create a necklace. We often say that the best gifts are not material things, but rather those intangible things that stay with us forever, like memories from our childhood or the time we spent with a special someone. The reality that these moments are fleeting makes us treasure them even more. 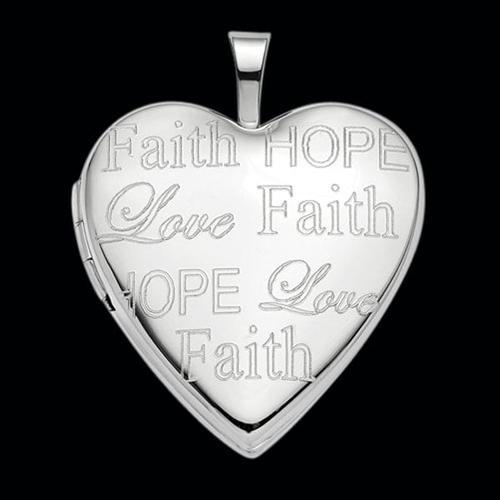 A silver locket is the perfect gift for sentimental occasions. 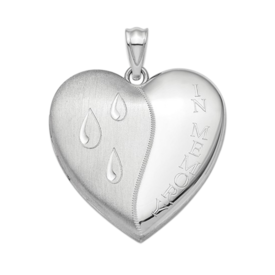 This piece of jewelry keeps photos and other mementos that allow our loved ones to bring precious memories with them wherever they may go. Silver jewelry attracts a lot of attention because of its sheen and shiny quality. The metal, especially sterling silver, has a white color and a brilliance that can make any piece of jewelry stand out. Besides being durable, sterling silver is extremely malleable and can be shaped in any pattern, yielding artistic pieces of jewelry that can be worn every day or during special events. Lockets are precious gifts that can be given to anyone on any occasion, whether it is their birthday, wedding, anniversary, or as a celebratory present. This piece of jewelry is versatile and can be worn for different occasions, lending a personal and sentimental touch to a person’s style. Keep silver jewelry in a separate place from other metals to avoid scratching or damaging the pieces. Preserve the metal by keeping it in airtight containers such as zipper bags to slow down tarnishing. Handle silver with care because it is soft and delicate. Clean silver jewelry the right way. Home solutions such as toothpaste can be used instead of silver cleaners for incredibly intricate pieces. Polish silver jewelry with a soft cloth after use to keep it shiny. With the proper care, any piece of jewelry can last a lifetime. For long-lasting and durable jewelry, buy only from shops that use the finest materials, premium metals, and genuine stones. Lockets by Gracious Rose come in different styles. 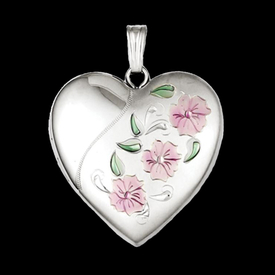 For your mother, sister, or relative, you can choose a locket with a floral engraving. For your lover, buy a heart locket. For the special man in your life, you can purchase the larger lockets. Gracious Rose online has a wide array of designs for silver lockets and other pieces of jewelry These handcrafted pieces are made from ethically-sourced stones and metals and are beautiful additions to any attire and jewelry collection. Preserve special memories with a silver locket by Gracious Rose. Choose one from the stunning designs in our 3,500-piece jewelry collection. Shop today and get free shipping on orders over $250!